According to police, the bus and an unidentified vehicle collided at the aforementioned intersection for reasons that have not been confirmed at this time. Following the initial collision, the bus ended up slamming into a bagel store located in the area. Officials from the FDNY stated that the crash prompted a response from emergency medical crews, who attended to five individuals at the scene. One of the five people who was evaluated at the crash site was reported to have been transported to a nearby hospital, although the extent of that victims’ injuries has not been reported. The driver of the bus suffered at least minor injuries as well. The cause of the incident is under investigation and no further information has been made available. First and foremost, our sincere sympathies are wholeheartedly extended to the injured victim or victims of this accident. 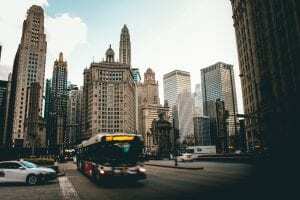 Unfortunately, bus accidents in New York are often seriously injurious or fatal, especially those which occur on at an intersection and involve several parties. While it can be tremendously difficult, it is important for victims to know that they may likely have substantial rights at this time. At Hach & Rose, we understand that there is nearly nothing as overwhelming as dealing with a sudden injury. As members of the community, our compassionate New York accident attorneys are here for you 24/7 to answer any questions you may have. If you have been hurt in a New York bus accident due to the actions of another party, please do not hesitate to call 212-779-0057 today.